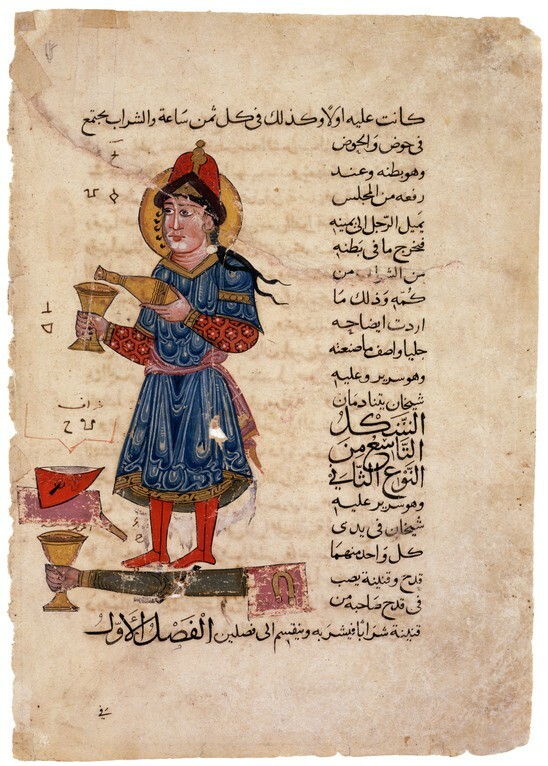 The mechanical genius al-Jazari was in the service of the Artuqids in Diyarbakir when he finished his Book of Knowledge of Ingenious Mechanical Devices in around 1205. It contained descriptions of humanoid metal robots like this one, but also door handles and combination locks quite similar to examples in the David Collection (38/1973 and 1/1984). 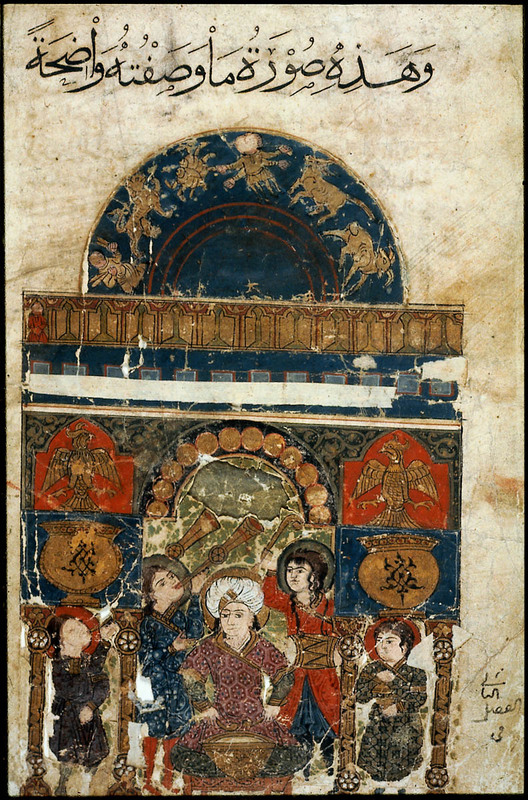 The manuscript was copied in 1315, and although the costume with the tiraz band around the sleeves and the distinctive hat are in accordance with contemporary Muslim fashions, the style, as in so much other “Arab painting,” was influenced by the Christian painting tradition, as shown e.g. by the physiognomy, the halo, and the folds of the kirtle. 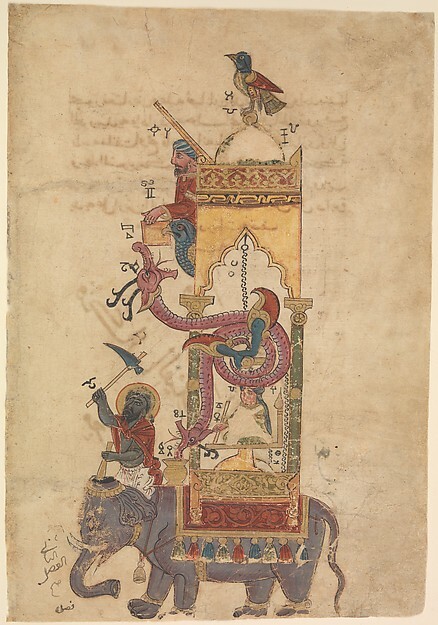 One of the earliest and most fascinating illustrated manuscripts from the Arab world is the so-called Automata by al-Jaziri. The text is devoted to the construction of fifty mechanical devices, including different types of clocks, fountains, and containers for liquids. While the compositions are primarily intended to illustrate the mechanisms of these ingenious instruments, their vibrant colors and fine surface details enhance the pictorial interest of these early scientific manuscripts. The first chapter of the Automata discusses complicated hydraulic clocks and their various components. One such clock is adorned with a copper disc decorated with the signs of the zodiac. Each one encircles the sun and moon along its own orbit. At certain times of the day, the disc revolves and musicians play to announce the new hour. The Basin of the Scribes belongs to the chapter on pitchers, basins, and other vessels containing or measuring liquids. The device is intended to specify the exact amount of blood taken from a patient. 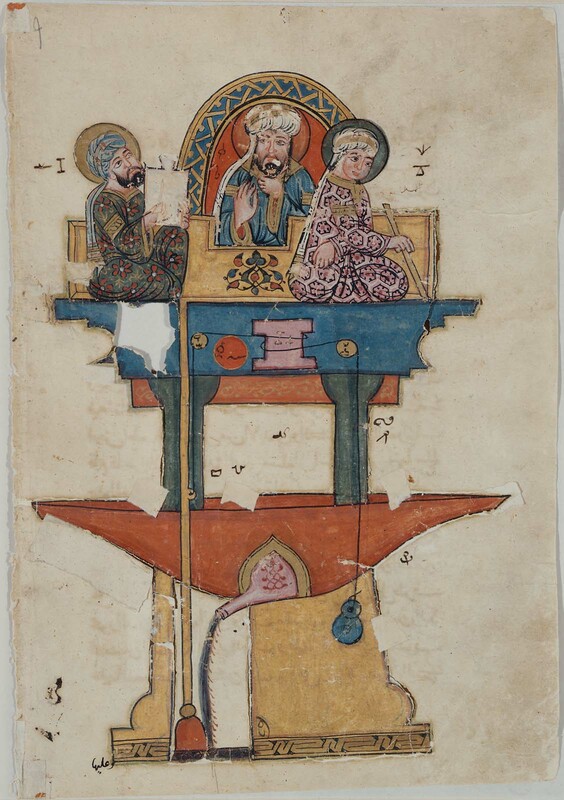 According to al-Jaziri, two scribes are placed on a platform supported by columns. The pens of the scribes move according to the amount of blood gathered in the basin below. Leaf from a manuscript of al-Jazari's "Book of Knowledge of Ingenious Mechanical Devices" (Section I No. 1). The page depicts an elaborate clock in the shape of a palace gateway. Leaf from a copy of al-Jazari's "Book of Knowledge of Ingenious Mechanical Devices" (Section III No. 7). The illustration depicts a device for measuring the amount of blood let from a patient. 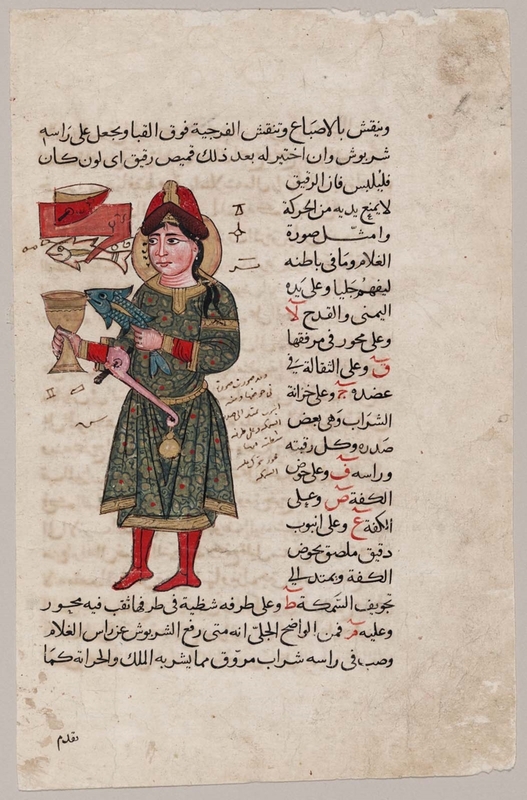 This page comes from a treatise on fantastic devices invented by the author al-Jazari. His elephant clock was especially intricate: every half hour, the bird on the dome whistled; the man below dropped a ball into the dragon’s mouth; and the driver hit the elephant with his goad. While illustrated manuscripts were growing increasingly popular at the time, this folio is a rare survival from Syria, where few such manuscripts are known from this date.